A lot of cleanses and detoxes out there may leave you feeling lighter, but also a bit crazy and deprived. Kitchari (or kitchadi) cleansing is deeply rooted in Ayurveda. The concept is a meal that is easy to digest and nourishing for the body. 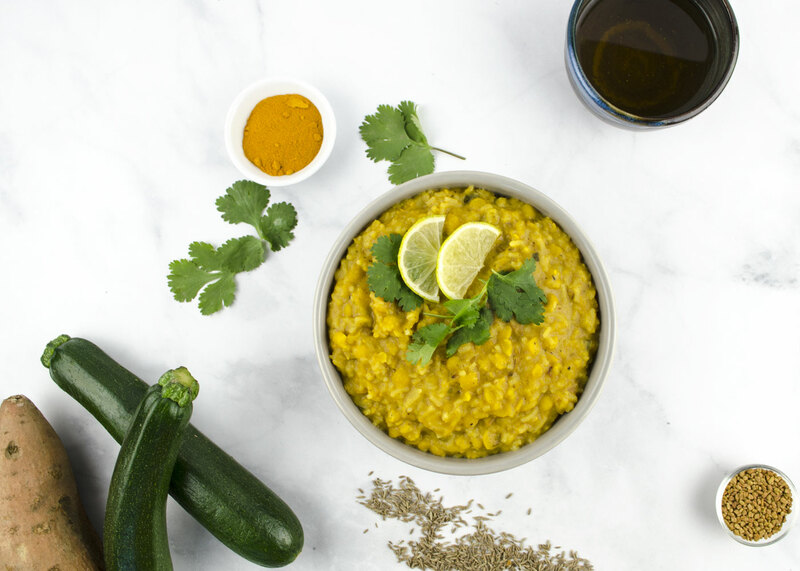 Kitchari offers a complete protein, and essential nutrients for your body. This cleanse is a monodiet, which means you will be eating this for all meals each day. Generally, a kitchari cleanse is followed from a short 3-day cleanse, to a longer 2 weeks. If this is your first time, start with 3 days. For breakfast, some kitchari cleanses suggest a simple oatmeal could be substituted for kitchari. Look for split yellow mung beans. This is recommended because it is said to not produce gas, which is important when considering that the point of a kitchari diet is to have a meal that is easy to digest. White basmati rice is used for the same reason. The hull is removed, making it easier on digestion than brown rice. There are many versions of kitchari available, but all follow the same basic concept - split mung beans, white basmati rice, and a blend of spices. Ideally, look for a blend of spices that balances your constitution. There are ways to adapt this to suit your diet. You can switch rice for quinoa to get more protein, or use riced cauliflower to cut grains. If using cauliflower rice, we suggest cooking this separately and adding to the bowl when serving. You can change up the vegetables each day, or try to play around with the spices that work for your constitution. It is recommended to drink plenty of water, and also herbal tea. You can try our Pure Infusion detoxifying tea, or try to blend one specifically suited to your dosha. Tri-doshic (balancing for all dosha types: Mix 1 tsp cumin seed, 1 tsp coriander seed and 1 tsp fennel. Infuse in boiling water for 5 minutes. Any leftovers can be reserved and reheated, or drank at room temperature. Why now? In Ayurveda, seasons are significant. Cleansing in spring or fall is common practice, as these are often pretty dramatic changes in our environment. For best results, soak mung beans overnight, or at least for an hour. This will help digestion. Rinse soaked beans. In a pot, toast cumin, fenugreen and cloves for 2-3 minutes over medium-low heat. Add remaining ingredients and bring to a boil. Reduce heat, stir and cover. Simmer at low heat for 30-45 minutes or longer, stirring occasionally.